Bangkok/Yaowarat and Phahurat is a star article! It is a high-quality article complete with maps, photos, and great information. Yaowarat and Phahurat (Thai: เยาวราชและพาหุรัด) is Bangkok's multicultural district, located west of Silom and southeast of Rattanakosin. Yaowarat Road is the home of Bangkok's sizable Chinese community, while those of Indian ethnicity have congregated around Phahurat Road. By day, Yaowarat doesn't look that much different from any other part of Bangkok, though the neighbourhood feels like a big street market and there are some hidden gems waiting to be explored. But at night, the neon signs blazing with Chinese characters are turned on and crowds from the restaurants spill out onto the streets, turning the area into a miniature Hong Kong (minus the skyscrapers). Phahurat is an excellent place for buying fabrics, accessories and religious paraphernalia. A visit to the area is not complete without having some of its amazing delicacies that sell for an absolute bargain — such as bird's nest or some Indian curries. Compared to the rest of the city, this district is fairly compact and can best be explored in a full-day (and night) walking tour. You'll come across street markets, shop houses, gold shops, beautiful remnants of colonial-style architecture and some interesting temples. 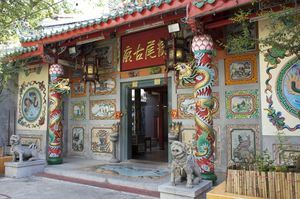 Instead of tramping from temple to temple, this neighbourhood is mostly about catching a brief peek into commercial Bangkok as it has been the last two centuries. Rushing through won't be rewarding—take your time instead, sitting at a plastic chair and watching local traders sell their wares. As the street markets are not targeted to foreigners, you will find a wide array of products: ceramics, fabrics, gold, tacky teenager ware, ant-killer chalk, Bollywood movies, ginseng roots. Who knows what you'll end up with at the end of the day. It is best to come during weekdays, as many stores close during the weekends. Also keep in mind that most shops close at 17:00 after which most of the area gets pretty much deserted (Yaowarat Road being a noteworthy exception). Orientation in Yaowarat is even trickier than elsewhere in Bangkok. The area is filled with narrow alleys and obscure pedestrian-only routes, and is crossed by a few giant roads that feel like small highways. Finding your way around isn't made easy as road signs are blocked by the bulk of neon-signs and other merchandise that sellers hang up to attract customers. The perfect map for the district still has to be created, so adapt to the situation and expect to get lost often. Also take note that alleys often bear the name trok instead of the usual soi, and that many have multiple names attached to them. For example, Trok Issaranuphap is often signposted as Soi Issaranuphap or as Soi 16, while Soi Phadung Dao is also known as Soi Texas. Yaowarat is centred, as could be expected, around Yaowarat Road, a big road bursting with neon signs. North of it is Charoen Krung Road, which is also one of Bangkok's major traffic arteries. Running parallel to the south of Yaowarat Road is Sampeng Lane, which is also known as Soi Wanit 1, a narrow pedestrian-only lane with many small department stores. Crossing these three streets is the pedestrian-only Trok Issaranuphap, another interesting lane for shopping and having small snacks. Another small lane crossing Yaowarat Road is Soi Phadung Dao, and that's the place to go when you're about to get hungry. Phahurat is centred around Phahurat Road, which starts immediately west of Sampeng Lane. It is crossed by Chakphet Road and Tri Phet Road, both major roads that have to cope with the immense traffic coming from the Memorial Bridge. Yaowarat is one of the oldest Chinese communities in Thailand. The story of the Chinese in Bangkok starts in the late 1700s, when poor peasants from China's Chaozhou region (in Eastern Guangdong) moved to the Grand Palace area in Rattanakosin. They came to Siam to find work in Thonburi at the other side of the Chao Phraya River (which at that time was the capital of the country). The Chinese were requested to move outside the city walls when King Rama I set up his new capital in the Grand Palace area in 1782. The new Chinese neighbourhood, nowadays named after Yaowarat Road, became Bangkok's main centre of commerce for the following two centuries. Formerly impoverished peasants worked their way up to become the backbone of trade in Siam. It also became known as a seedy area thriving on brothels, gambling houses and opium dens, though these activities are illegal nowadays and no longer to be found in the district. The business centre of the district moved from Sampeng Lane to Yaowarat Road and Charoen Krung Road in 1891, when those roads were built by a decree of King Rama V.
A few years later a fire broke out, which opened the way for the construction of Phahurat Road in 1898. King Rama V named it after his daughter Phahurat Maneemai, in remembrance of her early death at the age of ten. The area used to be an enclave of Vietnamese immigrants, who had lived here since the reign of King Taksin in the late eighteenth century. Construction of the road made way for the Indian community to move in and since then, this neighbourhood evolved its own South Asian character that persists today. As Thailand became one of Asia's emerging economies, the commercial core moved from Yaowarat and Phahurat to the Siam Square area. However, this multicultural district still shows what commercial Bangkok has been like for almost two decades. Due to its location at the Chao Phraya River, most visitors enter Yaowarat and Phahurat using the Chao Phraya Express Boat service. A single trip from Rattanakosin or Silom takes about 20 minutes and costs around 18 baht. 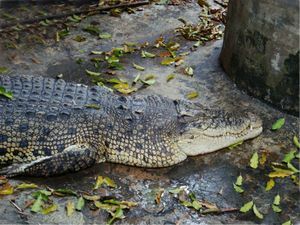 The most important stops are the Rachawongse and Si Phraya piers, both of which are served by all lines. Rachawongse is an ideal stop for central Yaowarat, while Si Phraya is close to the southeastern part of the district. 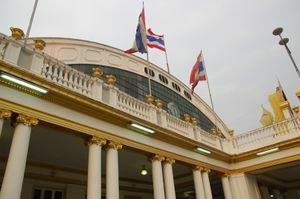 Phahurat can best be reached using the Memorial Bridge pier (saphan phut), which is only attended by no-flag and orange flag lines. Other piers that could be useful are Rachini and Marine Department, both of which are only served by no-flag lines. Use the map by the Express Boat dock to confirm operating times, and which flag-colored boats make which stops. If you're coming from Thonburi, you can cross the river by taking a ferry. There is a ferry service from Kanlayanamit to Pak Khlong Talat, from Dindaeng to Rachawongse and from Klongsan to Si Phraya. Ferries leave about every 15 minutes for just 3 baht. Yaowarat and Phahurat can directly be reached by metro if you are coming from Silom, Sukhumvit or Ratchadaphisek. The only station close to the district is Hua Lamphong at the eastern side. The metro ride from Silom takes about five minutes, while the ride from Sukhumvit takes about ten minutes. Trains leave every five to ten minutes for a fare of about 16 to 41 baht. From the metro station, it is a 20 minute walk to the centre of Yaowarat. The bus system in Bangkok is complex, but it is actually one of the cheapest ways to travel around the city. Many lines run through the district, but let's start with a warning: as Yaowarat Road is a one-way road, bus lines only use it in westwards direction (to Rattanakosin). Buses going east use Charoen Krung Road instead! Ordinary and air-conditioned bus 25 is the most important bus route. It starts in the far southeast of Sukhumvit Road, then follows that road northwest before heading through Ratchaprasong intersection (for Siam Square), Ratchadamri Road, Silom intersection, Rama IV Road, Hualamphong Train Station and then runs right through Yaowarat Road and Phahurat Road. This route can also be taken from the other direction, then it comes from Tha Chang pier (near the Grand Palace in Rattanakosin) and takes Charoen Krung Road instead of Yaowarat Road. From Khao San Road, catch ordinary (circular) bus 56 which runs along Tanao Road at the eastern tip of Khao San Road and then goes south through Maha Chai Road and Chakphet Road (get off after the Merry King department store for Phahurat Road and Sampeng Lane; don't miss it, as it will cross the bridge to Thonburi right after). Ordinary bus 4 comes from Silom intersection along Rama IV Road and passes Hualamphong Train Station through Yaowarat Road and then goes southwest over the Phra Pok Klao bridge to Thonburi (as with all routes, in eastwards direction Yaowarat Road is skipped in favour of Charoen Krung Road). Yaowarat and Phahurat can easily be reached from Hualamphong Train Station, which is located at the eastern border of the district. Trains come in and go to many destinations in Thailand, including Ayutthaya, Kanchanaburi, Chiang Mai and Southern Thailand. Sights abound around Yaowarat and Phahurat, but if you're looking for "must-sees", you might want to visit Rattanakosin first. While enjoying a relaxed walk through this district, you should at least incorporatea visit to Wat Mangkon Kamalawat and Wat Traimit. Other sights could be considered optional or more interesting for adventurous travellers. Take the Yaowarat and Phahurat Tour, a full day walking tour around the most interesting sights, markets and restaurants of the area. 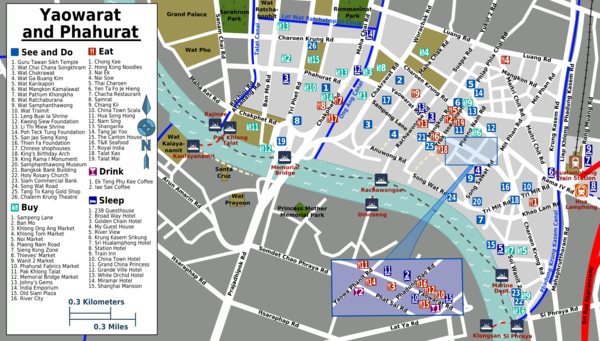 A great time to visit Yaowarat is during Chinese New Year (เทศกาลตรุษจีน), when Bangkok's Chinatown goes on steroids. Yaowarat Road will be closed to traffic as street festivities, lion dances and food fairs take place. Generally, a member of the Thai royal family comes over to celebrate among the Chinese community. Temples will be more packed than ever with many Thai-Chinese coming over to pray and burn incense. The best temples to visit this time of the year are Wat Mangkon Kamalawat and Thien Fa Foundation. Another festival you might want to attend is the ten day Vegetarian Festival (เทศกาลกินเจ), which is generally taking place around September or October. Many Thai-Chinese (and increasingly ethnic Thai) come over to Yaowarat during festival time to buy vegetarian products, such as vegetables, fruits and cooking ingredients. Most of the action happens around Wat Mangkon Kamalawat (which is also more lively) and in the area around Talat Noi. Look out for the yellow flags at the carts that show their meat-free status. Restaurants also adapt to the tradition, substituting meat products for soy-based products, even for traditional Thai dishes like tom yam. The most interesting festival dish are the yellow Hokkien-style noodles that are usually served with vegetables and mushrooms. Every year around late September or early October, the Mooncake Festival (เทศกาลไหว้พระจันทร์), also known as Mid-Autumn Festival or Lantern Festival, is held in Yaowarat. Chinese families and friends gather under the full moon to pay respect to the Goddess of the Moon. Their celebratations include the eating of mooncakes and pomelos together under the light of the bright moon. Many stores in Yaowarat sell mooncakes during festival time, so you might want to try one of these sweet cakes that come in many varieties. Typical for Yaowarat are its small crowded lanes filled with markets, that sell... well, anything you could possibly imagine. You'll stumble on items for sale as diverse as Chinese medicine, snake blood, Buddhist paraphernalia, toys, ant-killer chalk, car spare parts, typical teenager stuff and more. Parallel to the big Yaowarat Road lies Sampeng Lane (sometimes signposted as Soi Wanit 1, 08:00-18:00 daily) which is probably the most characteristic (if tacky) shopping lane of the area. This narrow lane, at some places having a width of less than one metre, used to be a shady area thriving on brothels, gambling houses and opium dens, but has now turned into a crowded lane of endless ramshackle department stores. The lane can roughly be divided into three sections, all of them selling different kind of products at bargain rates. The lower eastern part of Sampeng Lane focuses on cheap teenager accessories, such as cheap jewellery, toys, and hair products. In the middle part, there is more of a focus on shoes, Chinese ceramics and lanterns. Indian merchants have mostly taken over the part west of Rachawongse Road, where you can find fabrics, silk and other clothing. Don't expect high quality here, just shop for the heck of it. Shopping in Phahurat is not as rewarding for the average traveller, unless you are into Bollywood movies, betelnut leaves (paan) or Punjabi sweets. If you're looking for fabrics, however, Phahurat is definitely the place to be. And even if you're not specifically looking for fabrics, it is still a great adventure to visit the Phahurat Fabrics Market (Phahurat Rd and Triphet Rd, 09:00-18:00 daily). The first task is to actually find it: it is carefully hidden and you need to walk through a couple of other stores to get into it. Once you're there, you'll definitely know though, as it is a fabrics market on steroids. Thousands of retailers of Indian descent sell fabrics in every colour, shape and pattern you could possibly imagine. Some shops are specialised in custom-made wedding gifts, dresses and souvenirs. This old market is a labyrinth of narrow lanes, barely wide enough for two people to pass each other. It is the most typical market the Indian neighbourhood has to offer and has managed to keep its unique character ever since it was founded. Besides fabrics, Phahurat is also an excellent place for buying accessories, such as bracelets, trinkets and sandals. There are literally thousands of different kinds for sale, and all for a bargain, so mix and match as you wish. You'll also notice many stores selling religious paraphernalia like statues and pictures of Indian deities. As Phahurat becomes deserted at night, Pak Khlong Talat (ปากคลองตลาด, Chakphet Rd, 24 hours) just starts to become lively. Not having anything to do with the Indian community, this wholesale flower market is a great stroll through and a highlight in its own right. The endless piles orchids, roses and other flowers are an interesting sight, and there is something to be found for any budget. There are amazingly expensive bouquets for thousands of bahts, but your partner might even be happier with a beautifully created rose for just 50 baht. The market is open at all times, but the best time to visit is around 03:00, when the new flower batches come in from West and Central Thailand. If that is too late (or too early) for you, visit it from 20:00 onwards when the market is beautifully illuminated and very lively. A visit to the flower market can easily be combined with the Memorial Bridge Night Market (สะพานพุทธ Saphan Phut, Tu-Su 20:00-00:00), which is located at the Memorial Bridge pier. This cramped night bazaar is a fun walk through the dark, as plenty of colourful lights bright up the place. Expect nothing spectacular though, most of the products for sale are clothing, shoes and accessories for teenagers, as well as some second-hand items. Yaowarat has the city's best selection of Chinese restaurants, many of which specialise in expensive delicacies like bird's nest, abalone or fresh seafood (often still swimming in tanks near the entrance). The best part is that high-end seafood can be enjoyed here for very affordable prices. Gather the biggest group you can, preferably with a Chinese speaker or two, and head down for some re'nao ("hot and noisy") banqueting. Yaowarat Road and Soi Phadung Dao (often known as Soi Texas) are the places to be for typical Chinese delicacies. Travellers on budget might want to take a bite at one of the numerous hawker stalls lined up around Yaowarat Road. Trok Issaranuphap (พระยาอิสรานุภาพ) also has its fair share of simple plastic chairs and Chinese dishes, but is mostly known for its Chinese food markets. The Chinese in Yaowarat love shark fin soup, as it is so delicious. And cheap. Yet, you might want to think about the environmental effects of this tasty meal. Animal rights activists and environmentalists emphasise the brutal practice of shark finning, which happens largely unregulated at sea. As the Chinese economy is booming, more and more middle-class Chinese can afford eating shark fin soup. Shark specialists estimate that annually anywhere between 38 million and 100 million sharks are only killed for their fins. It is such a large number that it has the potential of significantly altering oceanic ecosystems. Eventually, the choice is up to you. If you're looking for Indian restaurants, your best bets are Phahurat Road and Chakphet Road. The roads themselves tend to get deserted after dark, so you might want to head off by taxi when eating time is over. If you're looking for bars or clubs, you were definitely in the wrong neighbourhood — until the 2010s. Since a few years, bars and restaurants are popping up in old shop houses on Charoen Krung Road. Furthermore in Yaowarat, you'll always find an opportunity to drink something you have never tried before. You might want to try the snake tonic in the middle of Phadung Dao Road, about 300 metres from the east end of Yaowarat Road. Based on Chinese traditions, an old man can cure any ailments you might have with this brew from the blood and meat of snakes. Not for the fainthearted. Not many people spend the night in Yaowarat or Phahurat, but there are some hotels available for the ones who'd like to explore the area more than just one day. Yaowarat is an interesting medium-cost alternative for Khao San Road, and the atmosphere is much more authentic. Many of the hotels have the same ramshackle feel as those found in the average Chinese city. If you need to catch one of the early trains (to Ayutthaya, Kanchanaburi or beyond), it can pay off to spend the night in the area around Hualamphong Train Station. Its location is ideal, as it is at the meeting point of three interesting districts (Siam Square, Silom and Yaowarat), while the area is also served by an MRT station. Despite the amount of people on the streets, there are not many options for public Internet access. Some of the hotels have internet access available, so your best bet is to visit one of them and hope they allow non-guests to use it for a fee. There are no dedicated Internet cafes, so for that, you might want to head off to Siam Square or Khao San Road. Looking for more temples? Rattanakosin is just northwest of the district and has dozens of them, including the Grand Palace and Wat Pho. If you like the street markets in Yaowarat and Phahurat, you might want to attend the much-larger Chatuchak Weekend Market in Phahonyothin. This page was last edited on 10 September 2018, at 05:36.